I was honored to be part of Jack Boyle's "A minute with Jack Boyle" at the Englewood Bank Fine Art show http://www.youtube.com/watch?v=l-2kyRPpdX4 along with being featured on his artist finder site www.artistfinder.info. *Englewood Spring Fine Art Show, March 31 & April 1st On Dearborn St.
Made by Nichole Moranda and LolaBlue for The Couture Show in Las Vegas. 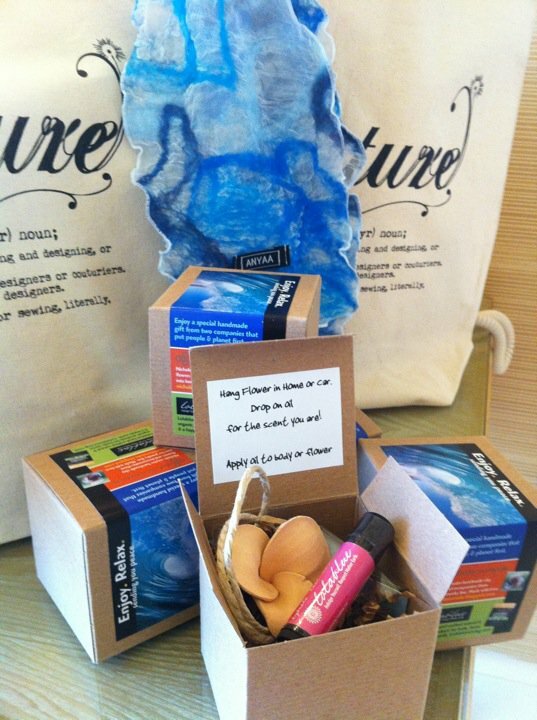 Box includes one porous ceramic flower diffuser, Oil sample(for body or flower) and lip balm from LolaBlue. 3 porous clay flowers ready for you to add the oil of your choice. Makes a great diffuser for your car or home. The ceramic flower is high fired in a salt kiln.